APRS 5th Class Entrance Test 2019, Apply online for APRCET 2019 APREIS 5th Class Admission Test 2019 Notification, Exam date, Eligibility, age limit, Online Application at aprjdc.apcfss.in https://apreis.apcfss.in/ APRS 5th Class / V class Admission Test 2019 Notification, Exam date, Online Application on Visit Official Website https://aprjdc.apcfss.in/ APREIS Website: https://apreis.apcfss.in/ . 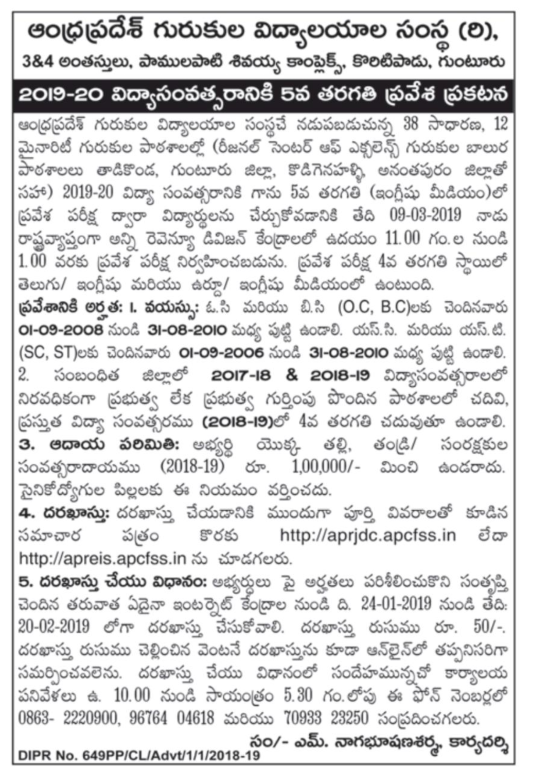 APRS CET / APRS 5th Class Admission Test 2019 Notification, APRS 5th Class Admission Test 2019 Notification, APRCET 5th class admissions, AP Residential School 5th Class Admission Test 2019 Notification and Online Applications available at www.aprs.ccg.gov.in. 5th Class APREIS Admissions 2019-20 Entrance Test. APREIS has been issued the notification for admission into 5th Class for the academic year 2019-20 Notification for admissions into 5th class in Andhra Pradesh Residential Schools in the AP. 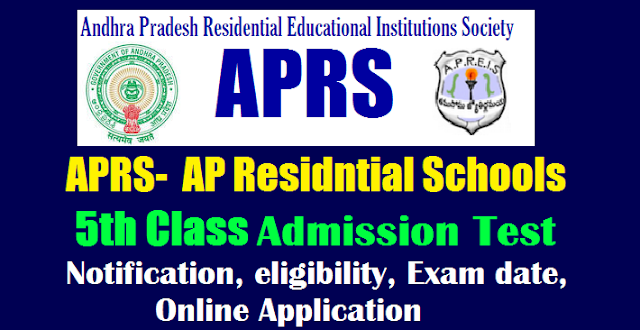 APRS 5th class entrance test 2019, AP Residential School 2019 / AP Gurukula patasala 2019 / APRS CET 2019 / APRS 5th Class 2019 Notification, Online application form, last date for apply, How to Apply, Selection process, scheme of exam, Eligibility, Fee,Test Centers, Hall ticket, entrance exam date, results, Selection list, certificate verification details are given here. APRS CET / APRS 5th Class Admission Test 2019:Andhra Pradesh Residential Schools Common Entrance Test which is also known as APRS CET. Andhra Pradesh Educational Institutions Society(APREIS) has issued the APRS 5th Class Admission Test 2019 Notification on 23rd January 2019 for admissions into 5th class in Andhra Pradesh Residential Schools in the AP State for the academic year 2019-20. The APREIS invites online applications from the eligible students in the AP State for admission into 5th class in its AP Residential Schools. APRS V/5th Class Admission/Entrance test 2019, APREIS APRS CET 2019, APRS Admissions 2019, AP Residential School Notification 2019-20 details as follows..
1. During the year 2018-2019 candidates must be studying 4th class in a Government School or in a school recognized by Government of AP. 2. The candidate should have studied in the same district for two consecutive years . 3. The candidate should have studied continuously in the respective district for the two academic years (2017-2018) and (2018-2019) ( 3rd Class & 4th Class) in a Government school or in a school recognized by the Government of Andhra Pradesh. The question paper contains questions in "Telugu" & "English" medium. Selections of the process through Entrance Test. 1. Merit in the entrance test. 3. Reservation for under special category. District Head Quarters (Candidate may choose any District to appear for test). Candidate have to pay Rs 50/- through AP Online / E-Seva centers and also through Payment Gateway (Credit Card / Debit Card / Net Banking ). The candidate after satisfying the eligibility criteria APRS 5th Class, can apply online mode only. The application process will be held in two phases, in the 1st phase the aspirants are required to pay the application fee while in the second phase, the candidate fill the online application and submit it . Candidate shall take a print of the application and store it, for future reference. 1. Study details for up to 4th class. 3. Caste in case of SC / ST / BC candidate. 6. Study or Residence or Relevant certificate for proof of local status. 7. Choice of help line centers is for certificates verification and options at the time of admission. 3. Date of Entrance Examination: 09-03-2019 from 11.00 AM to 01.00 PM.